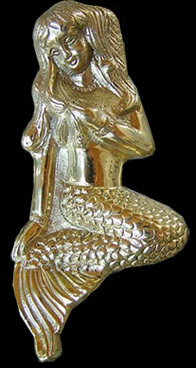 This beautiful Mermaid Door Knocker is made of the finest brass. Handcrafted with the finest details and materials, this piece of functional artwork will bring a lifetime of enjoyment. A unique design accent for your home that will be treasured and admired for years to come. Highest quality Brass, 4.5 inches H.